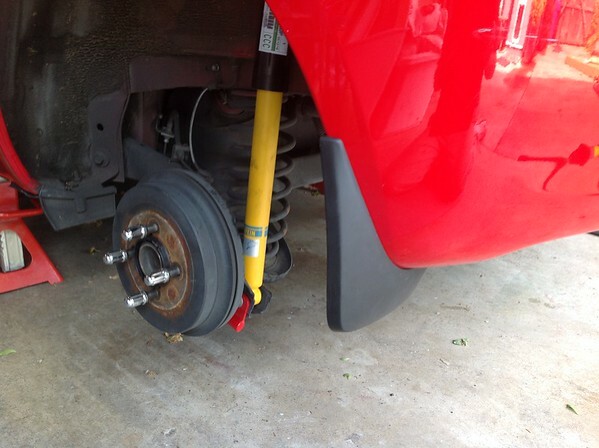 Park the clown car in the garage, set the parking brake and chock the front wheels in preparation for elevation. Inside the hatch, remove the plastic access cover trim plates. Remove the rubber boot over the top of the strut. So here's the first learning of the day. You really don't need to, nor should you, remove the top and the bushing plate completely. 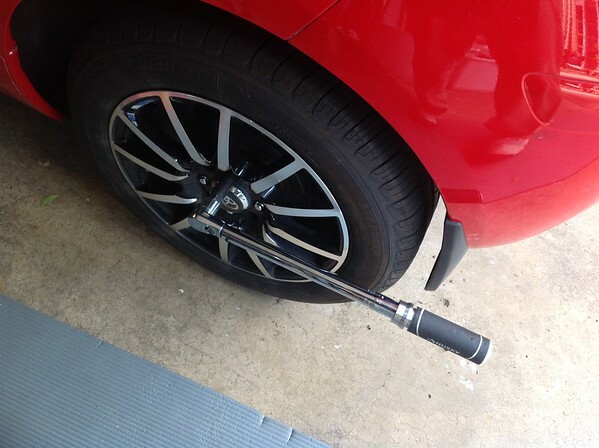 As you jack up the car in the following steps, it's possible that the loose strut will pull out of the support hole, which can cause a bit of a scramble while the lower shock bolt is still attached. So the Top Tip: Remove the bushing, but replace the bushing plate, and loosely fit one of the top nuts back on the strut. 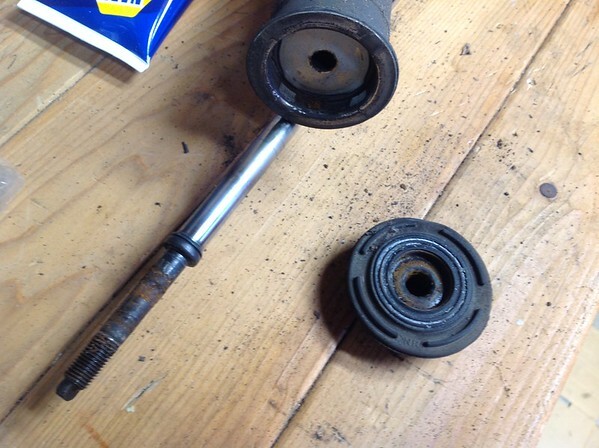 Using a breaker bar and wheel lug socket, break loose all four lugs on both rear wheels. This went swimmingly for 7 of the 8 lugs. On the last lug on the opposite wheel, it was frozen pretty good- it apparently had been hammered back on the last time the wheels were rotated. I hit it with some PB Blaster penetrating spray (and for that product, I have yet to find a seized fitting it can't cure) and was able to persuade it off without breaking the stud or the lug. That said, the stud and lug were pretty much chewed up beyond use, which prompted an additional step: visiting the tire shop to get the stud replaced, which cut into the celebratory beer time). From under the center rear of the car, jack the car up, lower on to jack stands set beneath the crimped metal/notch jack point immediately in front of the rear wheels. Here was another slight problem. I have a small 2 ton hydraulic jack, sourced from Harbor Freight some time ago. It's very servicable- down side is it couldn't jack the center point brace high enough to get the wheels off the ground, so I had to go back to using it under the crimped pinch point in front of the rear wheels. Remove lugs and wheels. Stow wheels under car, in front of jack stands, for added safety, and reinstall lug nuts on wheel studs. The jack stands were installed slightly forward from where I had intended, having to use the side jack points, but that all worked out ok. Here's where the first scramble occurred- with the hotdog-in-a-hallway fit upper strut, when I jacked the driver side of the car up, the strut pulled free of the mount location. That was a bit worrisome, and made the removal of the lower shock bolt occur a lot faster than planned, thus the lack of illustrating photos for this part of the process. 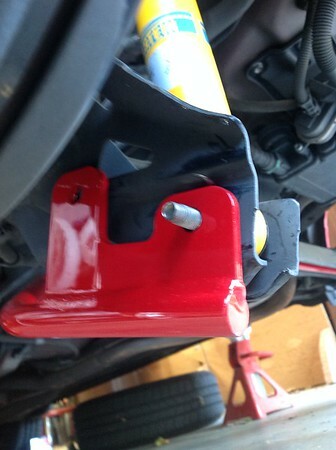 Place the jack under the shock, and lightly elevate to assist with lower bolt removal. No other pictures here, as the car was still on the jack, and I was scrambling to get the lower bolt removed. 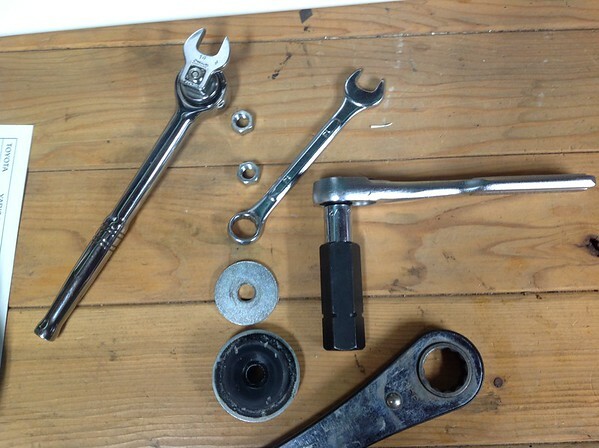 Using a 14mm socket, breaker bar, and wrench, hold the retaining nut on the lower shock bolt while loosening the bolt. Remove and retain the bolt and nut. 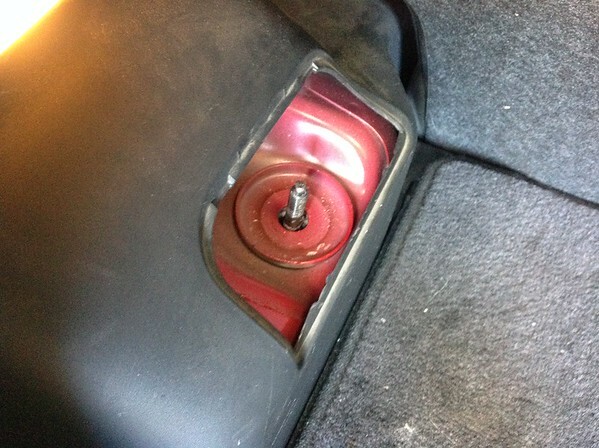 Remove the shock, including the bumper cushion bushing and cushion support. Verify installation of cushion support and bumper cushion bushing on shock. Lubricate surface of bumper cushion bushing with sil-glyde synthetic grease. As I have an industrial size squeeze tube of sol-glide, I liberally coated all sides of both the support bumper (which fits in the support tube at the top of the shock) and the upper bushing. Probably enough buttered on it to last into the next millennium. 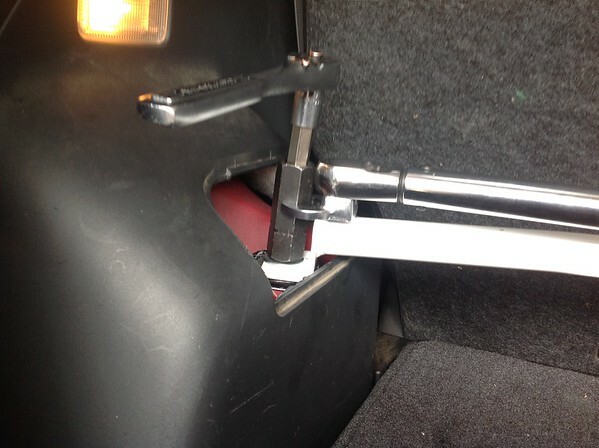 Install shock assembly, seating support and bumper cushion bushing to the upper shock mount. 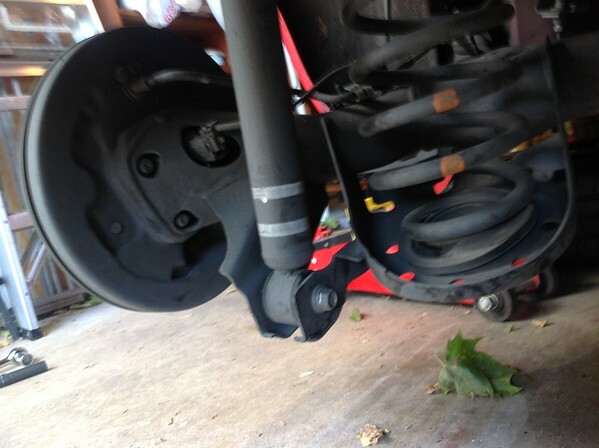 Install lower torsion spring / anti-sway bar on exposed bolt end and loosely tighten lower shock nut. 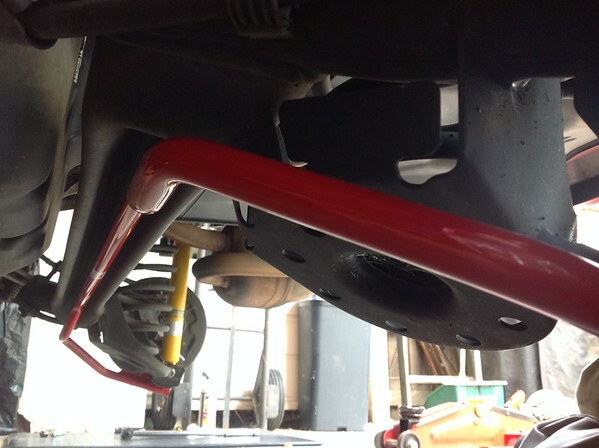 Here's how the bar wraps and tucks up under the suspension. It's as much a spring as it is a torsion bar- it is not connected not comes in contact with any other part of the body, except the two connection points below the shock. Install one mounting bolt and nut at designated location on each side of the torsion bar, and torque bolts to specification (44 ft-lbs). This is a change in sequence from my earlier posted instruction set- per the installation instructions that came with the TRD bar. Installed both positions first, and then went on to the next step. 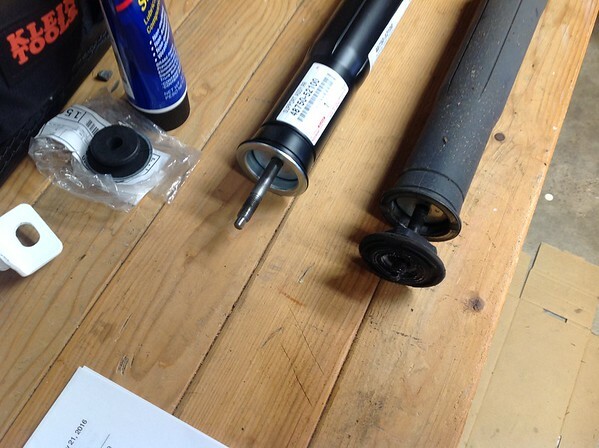 Lubricate upper bushing with sil-glyde and install on shock strut, along with bushing retention plate. Do not install upper nuts at this time. What follows isn't part of the suspension upgrade, it's a remnant job that had be done with the wheels removed, so here it is. I didn't stop to photograph any of it, because it is difficult to hold the a cordless drill, the work, and an iPad while sitting inside the fender-well. Suffice to say that while you were out in the lobby getting popcorn and cracker-jacks and a big soft drink, the following work was completed. 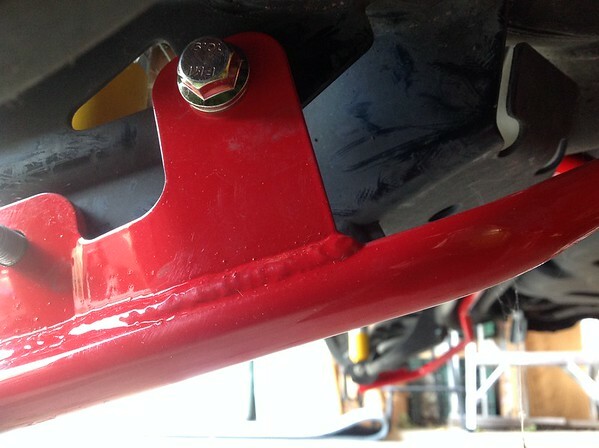 Locate new splash guards and using existing fastener to pin through bottom of the fender. Using a 6mm drill bit, drill two holes using the guard as a locater template. Install screw retainer and screws. Mount rear wheels and tighten lugs. Raise off of jack stands, and lower vehicle to ground. Torque all rear wheel lugs to specification (80 ft-lbs). Well, 7 of 8 of them, anyhow.... hey if 3 out of four is good enough for NASCAR, it must be ok for me, right? 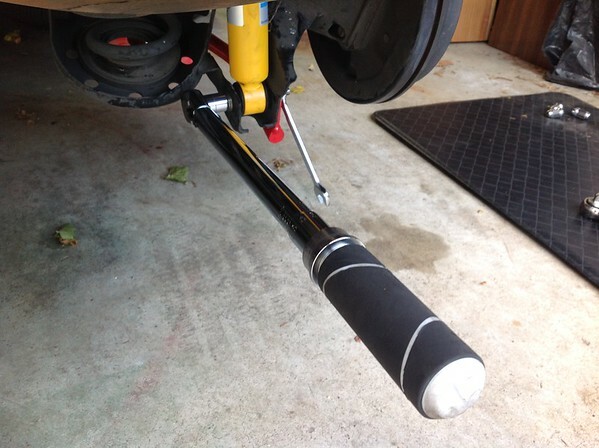 Locate and fit upper shock tower support bar over struts, including face washer, with car level on garage floor. 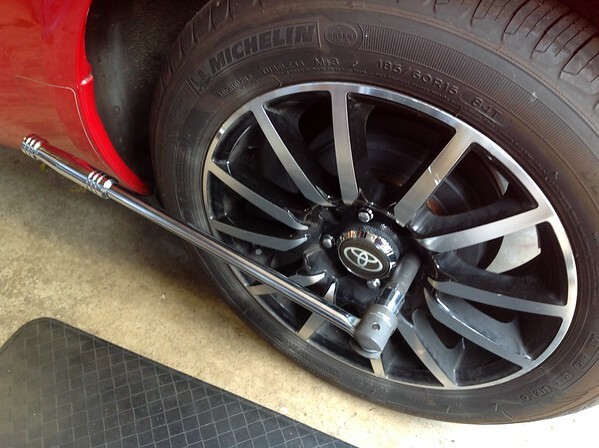 Using a socket wrench and shock installation tool, hold upper strut motionless while installing top nuts. Using shock tool and crowfoot 7/8 wrench on torque wrench, torque upper shock nuts to 18 ft-lbs. This doesn't sound like a bit deal, but as possible presidential nominee might say, "It's YEEUUUUUUGE!" It's important that the car is on the ground, not in the air. As the car settles back on the springs, the shock preloads. As the bushing is compressed, it drives the strut down to the proper preset location. The tools used are a bit involved, but it's all about keeping the center strut from turning while the nuts are tightened- partly because this can damage the shock, and more important, you will never get the nut tight if the strut keeps turning. So what's being used there is a Lisle 20400 Universal Shock tool. It consist of center hex key, which is slotted on either end to fit various sized struts. That fits down inside of an oversized socket. 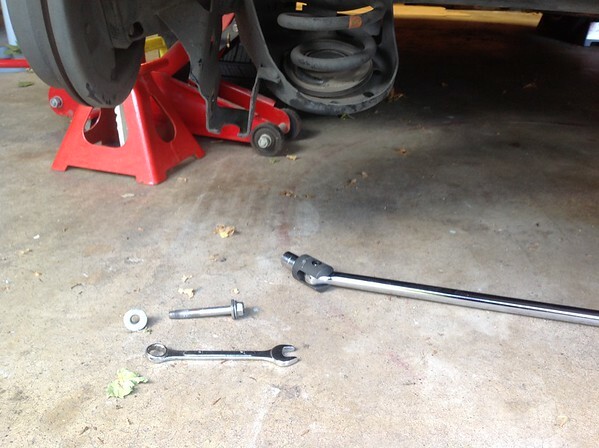 Use a 1/2" ratchet and socket to hold the strut still, and a 7/8" wrench on the shock tool socket. I used a ratcheting wrench for the initial lock down, and then followed on with a crow-foot 7/8" wrench fitted to the torque wrench to set the torque at 18 ft-lbs. (And I screwed up, and forgot to compensate for the 1" offset from the torque axis.. so the wrench should have been set for 16 ft-lbs, which would have yielded 18 ft-lbs. As it is, those nuts are all torqued down to 20 ft-lbs. Feel free to report me to the torque police). The assembly is a bit of a sandwhich- the lubed bushing is installed first, then the bushing retainer washer, then the strut bar, it's supplied flat washer, and then the two upper shock nuts, each torqued to 18 (errr... 20!) ft-lbs in succession. Cut and modify rubber boots to fit over support bar and install. Evaluate and modify plastic access plate covers as necessary and install, or otherwise retain. I didn't photograph all of this- I cut open the rubber shock nut cover, and refit it over the shock nuts (it's held in place by the rim of the bracket lip holding the bearing). I then marked out the plastic access panels, and cut an opening (test fitting and opening up a little bit at a time) until the fit was clean. The red wire on the right side is for the radio- it's spliced into the reverse light circuit, and tells the head unit to activate the backup camera when the car is in reverse gear. Remove wheel chocks, police work area, remove car from garage and test drive. No clanking, banging, driver screaming, or what not. 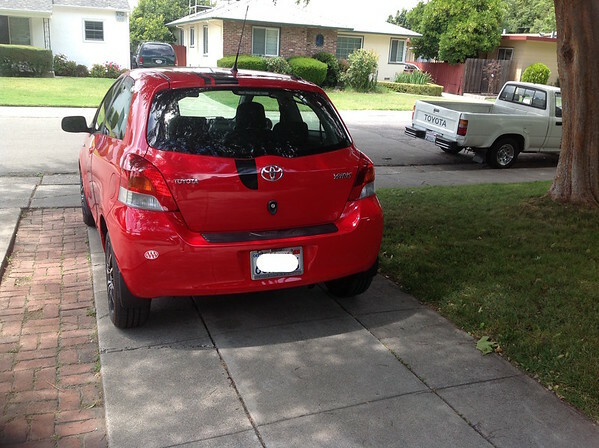 I bounced it around the neighborhood, over speed-humps, through a couple of good size pot holes, and on and off a curb, and heard no complaints out the suspension. The Bilstein's are a bit firmer than the OEM shocks, but it's not really noticeable. The suspension bits really make the car feel more stable in the corners, and hopefully it won't be blown about like a toy boat on a blustery bath when overtaking various semi-trailers. celebratory beer to mark success! Well, not yet. But perhaps later. Need to fetch some dinner, first. Hope the illustrations were helpful, and that you found your time here well spent. No refunds or warranties expressed or implied. Read and repeat at your own risk. All Rights Reserved, 2016 Clown Car LLC. Last edited by Tapokata; 05-25-2016 at 02:21 PM. Thanks man. I'm doing homework and reminding myself of the steps. This post and the Tanabe Sticky are good reads. This should be in the sticky. Off to do some more homework before going to back to full stock. Very nice write-up! These are the kinds of things that help this community grow and thrive. Project so far: 2zrfe swap, Megan racing coilovers, TRD rear sway bar, whiteline bushings, RPM long tube header, midpipe, and DC sports xD exhaust, brake upgrade in front, MI stainless braided lines all around, matte paintjob, Takada cold air intake, various gauges, rear seat and belts removed. Thanks. I lurk here a lot, and don't post much. The best mod that I've done so far was CTScott's two button cruise control, which if just amazing. None of what I wrote here is of that quality , more just a step tutorial for me in handling the shock replacement, but I thought I'd try to give back a little here to balance the scale. Love the humor throughout the write up. 4- megan racing Front-Middle-Rear lower strut bar... now clanking, banging very hard sound to my ears !!! But the handling is awsome at all so noww do you think i need the rear strut upper bar to eliminate that heavy sound? Is like ting ting ting and sometime if i drive on bumps in a row, i feel the tire like little spin burn...anywayyy heelpp! You could crawl under and look to see if there are any signs of marking or abrasion, although I'm not sure what you do to remedy it, as the bar is bolted at two points and is pre-formed. What shocks are those? Do they also come in the front Struts? IF that question was meant for me, these are Bilstein B6 Heavy Duty Twin-tube Shocks (Bilstein part 19-236285). The rear shocks run about $90 each. 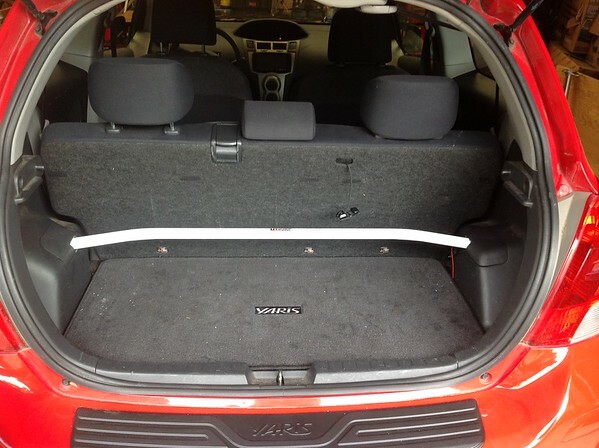 They make a front strut as well that fits the 09 Yaris (22-236272 for the front right, and 22-232265 for the left). The front struts are ~ $150 each. The front struts are more readily available- it took me some internet digging before I found a supplier for the rear shocks. The local auto parts store "carried" them- although they were custom order, pay in advance, with a lead time that was four to six weeks out. I don't know if Bilstein offers this in a strut assembly for this model. And in typical Bilstein fashion, the other bits (bushing, stopper, support tube, bearing support plate) are not included with the rear shocks. They do include a nylon-lock nut for the strut, which I discarded in favor of the OEM twin top-nuts. As I'm a coward when it comes to working on front struts (spring compression kits are things that go bump in the night, to me), I'll probably leave that replacement to the local Les Schwab shop, where they can verify and/or adjust the front end alignment at the same time. Hard to tell if you changed to a Tein on the rear as well, but I'd look at how you have the dampening setup on the front struts. It sounds like it's at a firmer setting (which I assume would be desirable at the track), but as you have added other suspension components, maybe now too firm? If the dampening is too firm, you're overly restricting the spring/shock travel as you come off the bumps, causing a bit of wheel hop. On the rears, I don't think the Tein has a dampening adjustment, so check the twin nuts on on the upper strut- if they are torqued down too tight, you can be overloading the shock. There's a rule of thumb from the Hayes manual that I can't recall at the moment- that you don't want less than 15mm and no more than 18 mm of exposed thread on the strut as measured from the top of the lower nut. If you re-torque these strut nuts (18 ft-lbs is the OEM spec), you want BOTH rear wheels on the ground when you do this. Finally, if the problem is worse after adding the lower support braces, I'd remove those one at a time, until you come up with a combination where you're not banging the suspension around, but still have the handling you are looking for. Last edited by Tapokata; 05-24-2016 at 11:37 PM. I don't think the rear strut brace will get rid of your noise. In your second photo, the clearance between the added brace and the well where the TRD sway bar resides seems to be almost nil. The added bracing just means the forces causing the flex are distributed in a different location- quite possible that your clanging is happening as that brace location. Pull it out, and see if your noise goes away. The minor banging about coming from the rear can be related to the preload position on the strut when the rear shock was installed. You want to have 15 to 18mm of exposed strut from the top of the bottom lock nut- figure a 1/2" for a rule of thumb. If you increase that- for example over tightened and now have a 1" of exposed strut, the shocks are further dampened, and you'll get some added noise as the shock and support bumper get pushed together. Depending how the strut brace installs, you may cure the above issue when you reinstall the strut nuts, which in turn MAY quiet things down- but given that the really loud noise didn't start until you added the cross bracing, my best guess is the brace above the rear TRD bar is colliding with something. is that rear brace only resting on the strut? shouldnt it fit snug on the cups? CAN it fit inside the cups? Won't fit. The bracket on the brace is too small to hold the strut bushing. The layering goes bushing-bushing retainer plate-strut brace-flat washer-top nuts. The strut doesn't move. It is held in place in an X,Y orientation by the bushing and in the Z orientation by the crush from the top nuts. I have a few doubts that a cross piece secured against a rubber component has a large stability impact, but it is applying some lateral force in the same relative area as the bushing. The strut back is an oval cup, witha a slot cut out for the strut. Uncompressed overall length of the Bilstein B6 was the same as the OEM shock (I had them side by side on the workbench). The B8 is a performance shock, designed for lowered spring sets but the B6 is an OEM equivalent (verified by BilsteinUSA support). The Tein's may be a different size, but the Tein coils appear to be adjustable.